Buyspoke's founder runs a weekly flea market in Moseley, Birmingham and running this market gave him the idea of creating a website for local arts and crafts people to sell their handmade and vintage items online. We were briefed to produce design work to reflect a warm and friendly brand with an emphasis on elegance and the quirky nature of the site's main styles of product. Our first consideration was what colours to use for the brand. The colours needed to reflect the warmth and friendly nature mentioned in the brief. We settled on a wine-like red as the main colour, with a deep, royal blue as secondary. The red wine colour was selected following a short word association game we played, where 'wine' was the word most associated with 'vintage'. Red wine also has an association with friendliness and positivity and it's colour lies in the warm area of the spectrum. The blue was thought to be a colour that worked well alongside the main red, and was a favourite of the client. Later on in the project we created a key to distinguish products as being either vintage or handmade, with a glass of red wine indicating a vintage item and a blue painted handprint marking an item as handmade. Next came the creation of a logo. After testing a number of different typefaces, including the lovely decorative geometric, Poiret One (eventually deemed too lightweight and not versatile enough), we settled on Georgia, a serif typeface which is equally at home both on-screen and off. It has an elegance and flourish to it, representing the arts and crafts aspect of the brand and also has a strong bold for headings and promotional literature. We felt the logo needed an extra touch; a symbol to reflect the brand and make the logo more memorable. The shopping tag seemed to work perfectly and elegantly props up the lettering, with enough space between the two so as not to clash. We eventually rolled out the branding across various print platforms, such as leaflets, business cards, flyers and posters. We designed the website in its entirety, making sure it was visually appealing and user-friendly both at the front-end for buyers visiting the site, internally for the registered user and at the back-end for site administrators. After researching competitor sites and constructing a wireframe for the whole site, we set about working on some visual designs. The home page needed to perform a number of functions. 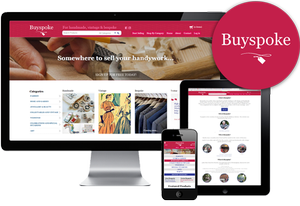 It needed to introduce and show off the Buyspoke brand, act as a shop window to the users' products, and urge visitors to sign up to sell all at the same time. It was decided that the home page needed to have a slide show / image carousel to really attract the visitors eye when they first land on the site. We settled on four images which were suitably impactful. We also overlayed some short sentences outlining the Buyspoke mission and highlighting the USP of the website - the fact that it is completely free to register and sell your goods. The slide show therefore also serves as a call-to-action; we added a button directing people to 'sign up for free today' on each image. You'll also notice a prominent search bar, all the relevant navigational buttons, social media links and a shopping cart. It was important not to take up too much room with this tool bar but also to get the spacing between the different elements right; spacing is always a crucial aspect of design. We put a categories menu on the home page, to the left underneath the image carousel, but also added a button in the top bar which pulls down a full list of all the item categories on the website. This allows for easy access to any product area from anywhere on the site. User-friendly and intuitive navigation is a key component of a well designed website. Without it visitors will become confused, give up and probably not come back. The more ways to link to different areas of the site the better. The home page also includes a row of featured products and sellers (basically the last four products to be listed and the last four sellers to sign up). We opted for four, allowing the images of the products to be sizable enough to entice visitors to click through to the individual product pages. We also included social media buttons for people to share any products they like with their friends which helps to build a buzz around the website, resulting in more visitors, more buyers and more sellers. Also note the different colours used to break up and differentiate the various pieces of information. We included a call to action banner just above the footer on the home page as an extra reminder to visitors to register to sell on the website. Underneath that, the footer contains another list of the main product categories, links to social media and another 'register to sell' button. The site's search result pages feature a filter column on the left for refining product searches and the individual product pages themselves have a sensible flow of information as you scroll down the page. Ensuring the website was as enjoyable and easy as possible to use was one of the most important aspects of the project (and indeed any project). When setting up a new store, clear graphic icons represent the different stages of the process. A simple grey to green transition to show which steps have been completed worked well, with a blue highlight making it immediately apparent which step it is you are dealing with. The back end of the website is the domain of the web administrators, but it followed the same design blueprint as the registered user area of the site. Again, clear pictorial representations show an administrator what outstanding 'house-keeping' there is to be done. As with all the websites we build, Buyspoke is SEO optmized and constantly monitored using Google analytics to show traffic numbers, sources of traffic and visitor habits, allowing us to make any design tweaks which we feel is of benefit to the user experience. Visit Buyspoke today. You may like to sign up for yourself!